This appeared first at The National. Plenty of news flows out from Gaza, but very little human information. This emotional blackout bothered Ra Page, founder of Comma Press, a Manchester-based publisher producing groundbreaking short story collections. It was Comma that gave the astounding Iraqi surrealist writer Hassan Blasim his first break. Comma has published a high-quality series of literary responses to scientific innovations as well as several collections based around cities such as Tokyo, Istanbul and Liverpool. Why not Gaza too? The book was by no means the first literary project to aim in some way to normalise Palestinian life. Since 2008 the Palestinian Festival of Literature (Palfest), brainchild of novelist Ahdaf Soueif, has tried to reaffirm, in Edward Said’s phrase, “the power of culture over the culture of power”. In practical terms, this means transforming a literature festival into a roadshow – Jerusalem one night, Bethlehem another, Ramallah on a third… Though these places are only a few miles apart, checkpoints prevent Palestinians from travelling between them. So the guest writers travel to their audience, and at the same time learn something of Palestine’s enormous creativity. This stateless nation has boasted many great literary talents, most notably Mahmoud Darwish and Mourid Barghouti in poetry and Ghassan Kanafani in prose. Meanwhile there are burgeoning film and music (especially hip hop) scenes. For decades writers had to smuggle their manuscripts out of Gaza to presses in Jerusalem, Cairo or Beirut. The shorter the text, the more likely it was to be published. As a result, the Strip became an “exporter of oranges and short stories.” Edited by novelist and journalist Atef Abu Saif, The Book of Gaza contains stories from three generations. It achieves both the sense of place that Page hoped for and ‘familiarity’ through its treatment of universal themes. The stories are as likely to deal with women “besieged by preconceptions” (in Najlaa Ataallah’s words) as the seige imposed by Israel. The project succeeded in ‘depoliticising’ Gaza, at least to some extent. Protective Edge lasted 51 days and nights in the summer of 2014, killing 2,100 Palestinians and injuring 11,000, the overwhelming majority civilians. 71 Israelis, the majority soldiers, were also killed. As usual, the war changed nothing. Hamas didn’t fall, its toy-missile stocks were soon replenished. The only effect was to further tarnish Israel’s decaying image in the West. The act seemed entirely redundant, performed for psycho-symbolic reasons, for the sake of impunity itself. 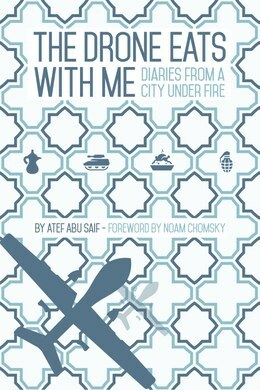 Now Comma publishes “The Drone Eats With Me”, Atef Abu Saif’s book-length diary of the war. Intelligent, passionate and fluently, sometimes poetically written, it’s the story of a family in Ramadan, of the agony and joy of fatherhood under fire, and of a community which somehow survives through rolling blackouts and sudden flashes of light, queueing for food or to use the bathroom, with whirring drones as familiar an irritant as mosquitoes (in Gaza the onomatopoeic word for ‘drone’ is ‘zanana’). According to Abu Saif, “the only real heroism is survival, to win the prize that is your own life.” But there are many losers. The planes, tanks and warships kill taxi passengers, sweet sellers, kids playing football; they crumple homes; they hit the port, schools, hospitals, farms, even cemeteries – grey bones flying out of graves. Abu Saif pictures this war machinery “feeding on” the city, devouring its landmarks. The streets are filled with trudging crowds, hundreds of thousands searching for haven in ever-smaller circles, the expulsions of 48 and 67 in eternal replay. He describes too the importance of rituals and routines to fence off the hallucinatory intensity of war. Alongside the constant undertone of terror – darkness “a ghoul that grinds and chews at our calm” – the account also provides a sensuous appreciation of beauty, in the scents, trees, food, and people of Gaza. While inevitably and everywhere political, the narrative is concrete and free of ‘politics’ in the rhetorical sense. Politicians are rarely named, there’s hardly a mention of Israel even, except through its visible (the weaponry) and implied (the operators) presence. Abu Saif imagines the latter unable to comprehend the reality of their targets. “Who will convince the soldier driving a tank that his vehicle is not a toy? That what he sees from behind his wall of armour-plating are not cartoon characters but real people?” Another day he imagines them far away at their screens ‘photoshopping’ the city, ‘deleting’ walls and buildings. None of the ceasefire terms have been met. Palestine awaits the next round.